Falls Avenue Resort will dim or turn off non-essential lighting to mark Earth Hour 2013. The 20 acre Resort will be joining the international community who will be participating from 8:30pm-9:30pm on Saturday March 23. The hotels, restaurants and attractions on the Resort have pledged to dim or turn off non-safety related lighting and equipment including the iconic signage that lines Falls Avenue. Guests will also be encouraged to participate by turning lights off in their rooms and by making environmentally conscious decisions during their stay. 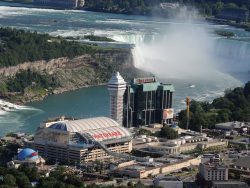 As many of the hotels and attractions in Niagara Falls are expected to participate, one of the best views of the freshly dimmed city will be from one of the Resort’s spectacular fallsview restaurants (Windows by Jamie Kennedy or the Rainbow Room by Massimo Capra) where guests will dine by candle light.